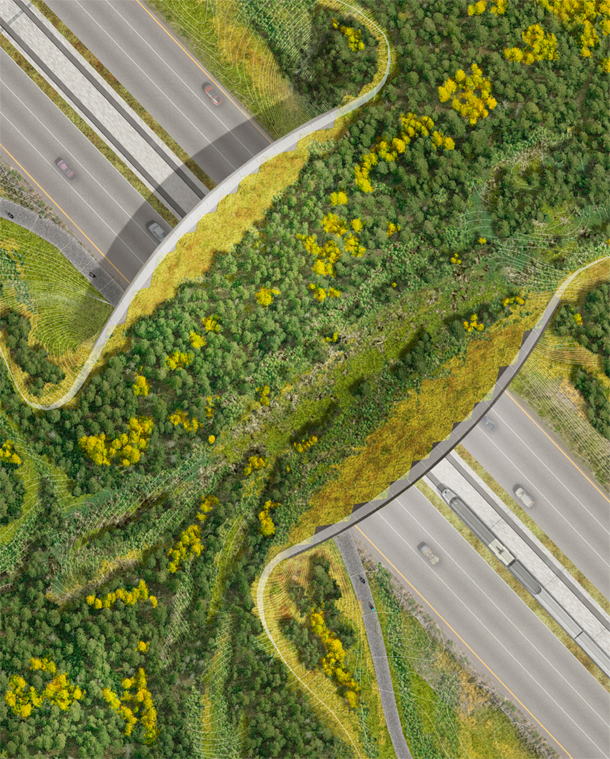 This competition sought specifically from its entries, innovation in feasible, buildable context-sensitive and compelling design solutions for safe, efficient, cost-effective, and ecologically responsive wildlife crossings. In doing so, the competition has raised international awareness of a need to better reconcile the construction and maintenance of road networks with wildlife movement. Five finalists were selected from an international pool of applicants, with Michael Van Valkenburgh Associates in collaboration with HNTB selected as the winning entry. The site is located along I-70 in Colorado’s Vail Pass – an area deemed to be of ecological importance but also high traffic volume and with a large frequency of vehicle / wildlife collisions. Due to the expanding suburban population and climate change, as well as widely dispersed resources, wildlife populations have become increasingly fragmented and forced to cross highways or other man made infrastructure (if you’re interested in this topic, look for my upcoming post on the book Rewilding the World!). Speaking to this, wildlife / vehicle collisions have increased by 15% in the last 50 years. Though the mortality rate may not be that high for humans in these accidents, they are almost 100% for the animals involved. Elevated corridors have become increasingly popular in the conservation community, and have been employed in North America, Europe, and Asia, notably in the Y2Y (Yosemite to Yukon) Initiative. Each design submitted for the ARC competition thus has sought to strike a balance that reconciles the mobility of humans and wildlife through the landscape, and how to create new habitat and road networks to avoid the collisions that we currently are faced with. Nice to see research, replicability, and depolyability play such a large part in the competition entries. Several schemes emphasized the ability to deploy the same design on various sites, and in various terrains. The HNTB/MVVA bridge in particular is conceived of as a measuring device, keeping track of the type and number of animals that cross it (not difficult using motion activated infra-red cameras and DNA sampling), which can then inform the placement of future overpasses or the expansion or re-positioning of existing ones based on their performance. The bigger the network of bridges, the more data is gathered on animal migration, and the better targeted the placement of future bridges becomes, in a big virtuous cycle of improved migration infrastructure. The bridges are also about performance even more than they are about aesthetics (with one red exception, even though it too deals with perception, picking up on many animals’ colorblindness). The crucial thing is for the landscape above to work. 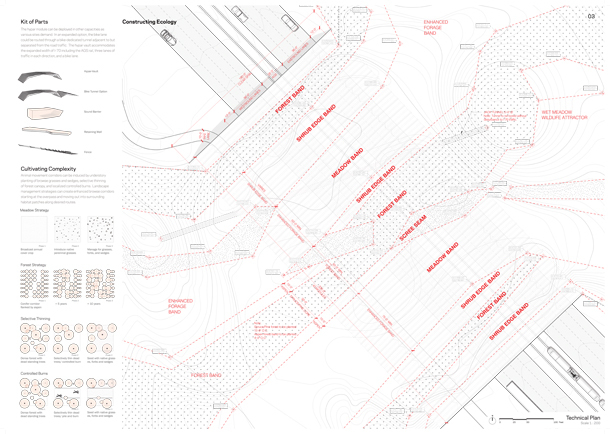 The landscape bands across the HNTB/MVVA scheme, for example, conform to the minimum width and plant spacing that would work for the desired habitat types, and the landscape process diagrams on the left are more like a roster of land management techniques for achieving the habitat types, rather than a finished “design”. Nobody cares how it looks, they care how it works, funelling animals to the bridge and across it. Thanks for the comment. 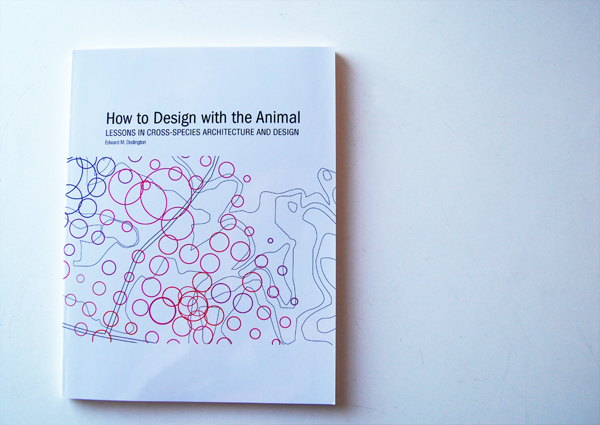 I especially appreciate your comment about performance vs. aesthetics which would seem to carry all that much more weight when considering the actual clients of a project like this (and like many on animal architecture). It’s hard to say exactly how much a moose cares about the aesthetics of any project, but one might surmise with a fairly high degree of certainty, that he (the moose) would care less about the paint and more about the pasture. So… to your point: How does one actually measure the success of the “landscape working?” Do you know of any studies or information about animal traffic across these bridges? Also, I’d be interested to hear if you had any information about the kind of animal-metrics (i.e. Designing for live-moose loads, the number of animals in a given herd…) that might go into the design of something like this! Interesting points. I think one measures the success of the landscape working is if the monitoring devices on the animal overpasses see more animals. Then of course we get into qualitative issues, such as, “are the species using the overpass those that we are interested in helping for the good of the larger ecosystem?” “Are we witnessing unforeseen consequences, such as too much predation at a prey species choke-point location?” Monitoring helps us determine the answers, and the modular construction of the overpass helps us take corrective measures. In terms of weight, the structural load of soil (in all the schemes except for the Dutch one, the soil depth is big enough for grown trees at mid-span, or at least shown as such) dwarfs that of a herd of elk. So bring on the herd; the structural engineers give the ok. In terms of studies of actual animal behavior on overpasses, those seem limited at this point primarily to Canada and Germany. Maybe if any of these design get built, we’ll be measuring animal behavior in Colorado.